I was at a grand opening event not long ago when one of the hosts said to me, ‘Any customer is a good customer’. It’s a phrase that goes with ‘The customer is always right’. Both are easy to say and sound upbeat in general conversation, but is it really true? Don’t get me wrong, we love it when customers place orders (really, don’t let me stop you if you were going to click right now). The truth is, however, that not every order, or every customer, is a perfect fit for our business. I know business people who will balk at this idea and would never utter this in public. But if you’ve ever been so tuned in to your business that you actually ‘feel the pulse’, you know it is true. Real magic in any business happens when you connect with those people who not only understand your product or service and have a need for what you provide, but who believe that you are in business for reasons that align with, and support, their values. In a TEDx talk, Simon Sinek, diagrams what he calls the golden circle. 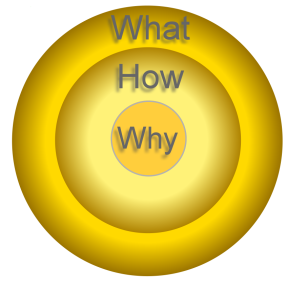 In this circle, there are three layers, the ‘what’, the ‘how’, and the ‘why’. The what is on the outside, followed by the how. In the center, is the why. For Anna’s Gourmet Goodies, it’s pretty simple to define – we bake cookies and brownies. If this was all we focused on communicating, we would probably sell products to some customers. But, we’d be like another car horn on a busy street in Manhattan rush hour traffic vying for attention. Our cookies are good (to be sure), but there are plenty of companies out there trying to get people to buy their cookies. We make our cookies by hand, using the finest ingredients. Okay. I’d hazard a guess that you’ll find that phrase not just in the descriptions and brochures for other cookie businesses, but used by a slew of other companies that make food products as well. It’s a process that other businesses follow. It’s true, but so what. Finally, we get down to the heart of the matter. The tagline for Anna’s Gourmet Goodies, ‘Our cookies make people happy’, describes in simple terms, why we do what we do – to bring happiness to someone’s life. Sometimes it’s a box of cookies (what) we ship to a client’s office (how) as a thank you gift. Or it might be a gift tower (what) we send to a college student at their dorm (how) to celebrate their first birthday away from home. In some cases, we’ve delivered cookies that we hope provided some measure of comfort during the last days of a person’s life. All were cookies (what) that we made by hand from ingredients that we select and shipped to the end customer (how). We believe that a simple gesture of giving someone something really good, that was lovingly made, packaged and delivered in a unique way, when they least expect it, without asking for anything in return, brings happiness and a smile to almost anyone, even if for a brief moment. It just so happens, that we also make really good cookies and brownies. It is the why behind what we do that is the most important ingredient. We seek to deliver a brief moment of happiness to every person who opens a box of our cookies or brownies. To spark a memory. To generate a smile. To provide respite from the pressures of the day. To make people happy. That’s the why. Most businesses focus on the what and the how. There will always be some number of customers who order something based on answers to these questions. If anyone comes to our website, places an order with a valid credit card and address, we’ll bake and ship it. Ultimately, however, we execute on the why part of our business and attract customers who make an emotional connection to the idea of sharing happiness by sending one of our gifts to another person. They value what we do beyond simply the amount of money spent on a purchase. Fortunately, the world of technology we live in today has made finding the why easier than ever. We can search, post, share, like and collaborate with our friends next door and around the globe, all at the click of a button. The war for transparency in business is over – the Internet won. What might happen in your business or your life if you were to stop and focus on the why? Would it make a difference in the customers you attract or the people in your life? I believe that it does. And once you’ve had a taste of that magic (sort of like our chocolate chip cookies), nothing else tastes quite as sweet. If you should decide to send a gift to someone, or maybe you have opened a box of our cookies with a cold glass of milk at some time, I want you to know that the why will always the same – to make people happy.